Shorter spacers in the front corrects the factory tail-down rake. Models with plastic bumpers require removal of bumper-to-fender wind deflector/splash guards in order to fit 35” or larger tires. 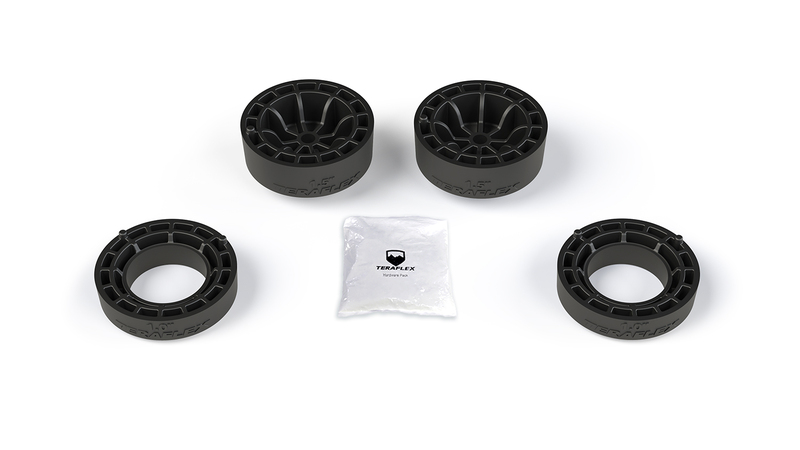 Rubicon models require JL/JLU 2” Bump Stop Strike Pad Kit (# 1959500) in order to fit 35” tires – NOT included. Falcon Series 3.1 Piggyback (# 10-01-31-400-000), or 0-1.5” Lift Falcon Series 3.3 Fast Adjust Piggyback (# 10-01-33-400-000 shock absorbers.